Pha Nam Yoi, meaning Nam Yoi Cliff, is a massive stone cliff where ancient Buddhist ruins are located. The area of Pha Nam Yoi extends over nearly 8,000 acres, with a forest of hardwood trees and wild animals such as boar, barking deer, and red junglefowl calling the area their home. Pha Nam Yoi rises 200 meters from the ground, approximately 380-500 meters above sea level. On the hill is a temple named Wat Pha Namthip Thep Prasit Wanaram, which covers nearly 1,000 acres. The temple was built by Phra Achan Si Maha Wiro, a devotee of venerated monk Phra Achan Man Phurithat. The temple also houses Phra Mahachedi Chai Mongkhon, one of Thailand’s largest Chedis(stupas, religious relic structures), which was designed by the Fine Arts Department. 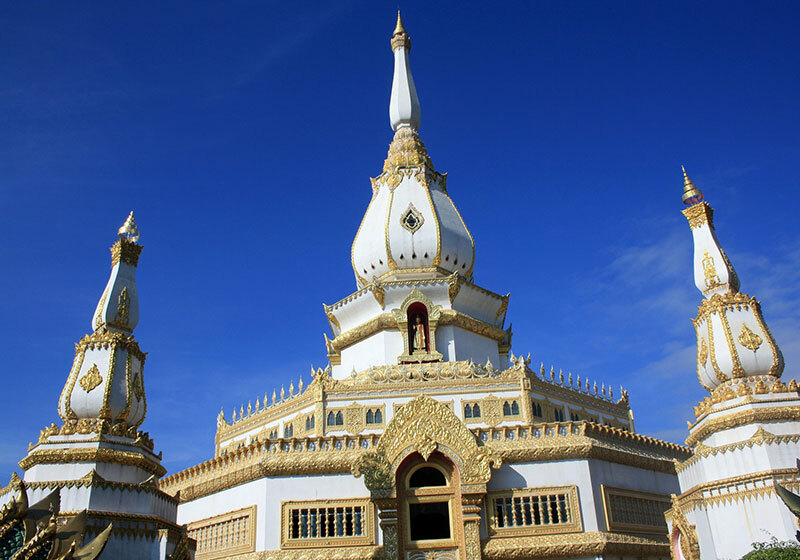 The white Chedi is embellished with golden motifs and surrounded by smaller Chedis at the eight directions. It is beautifully decorated with a mixture of an ancient and contemporary-style of art. The entire site is located at Ban Khok Klang, Tambon Pha Nam Yoi and borders Nong Sung district of Mukdahan province and Kuchi Narai district of Kalasin province. Short Description: Pha Nam Yoi, meaning Nam Yoi Cliff, is a massive stone cliff where ancient Buddhist ruins are located. The area of Pha Nam Yoi extends over nearly 8,000 acres, with a forest of hardwood trees and wild animals such as boar, barking deer, and red junglefowl calling the area their home.